This lecture explores social media as a new form of urbanization, the architecture of how we live together. Social media has constructed a new kind of virtual city that has taken over many of the functions of the traditional city. It also redefines and restructures physical space. We now inhabit a kind of hybrid space between virtual and real. As with the arrival of mass media in the early 20th century, social media redraws again what is public and what is private, what is inside and what is outside. It even redefines and restructures physical space, the architecture of houses and cities. The talk will take take place on November 24th in the National Gallery of Art, Konstitucijos ave. 22, Vilnius. Beatriz Colomina is an internationally renowned architectural historian and theorist who has written extensively on questions of architecture and media. She is a professor of History and Theory of Architecture at Princeton University. Ms. Colomina has taught in the School since 1988, and is the Founding Director of the Program in Media and Modernity at Princeton University, a graduate program that promotes the interdisciplinary study of forms of culture that came to prominence during the last century and looks at the interplay between culture and technology. The question Are We Human? is both urgent and ancient. 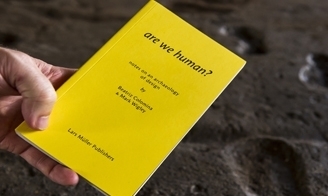 Beatriz Colomina and Mark Wigley offer a multilayered exploration of the intimate relationship between human and design and rethink the philosophy of design in a multi-dimensional exploration from the very first tools and ornaments to the constant buzz of social media. The average day involves the experience of thousands of layers of design that reach to outside space but also reach deep into our bodies and brains. Even the planet itself has been completely encrusted by design as a geological layer. There is no longer an outside to the world of design. Colomina’s and Wigley’s field notes offer an archaeology of the way design has gone viral and is now bigger than the world. They range across the last few hundred thousand years and the last few seconds to scrutinize the uniquely plastic relation between brain and artifact. A vivid portrait emerges. Design is what makes the human. It becomes the way humans ask questions and thereby continuously redesign themselves.